Comics In 5 Panels: Cartoon Month: Medabots. 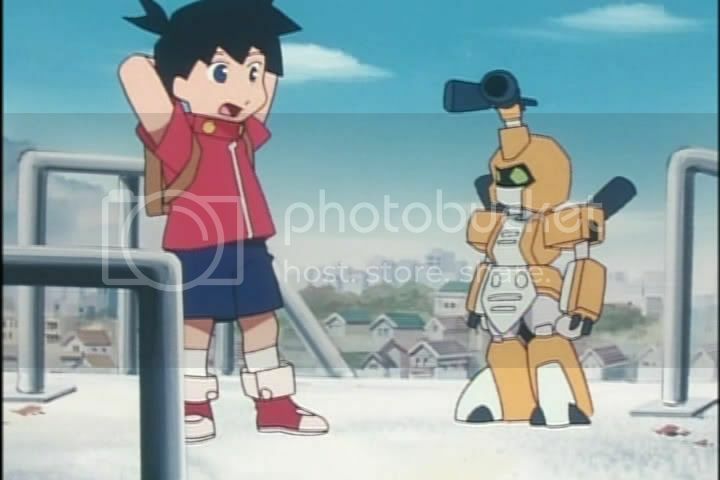 In the future, kids has pet-robots called Medabots, robots with advanced artificial intelligence thanks to a medal stored in the back(hence the name medabots=medal robots). And with such highly advanced robots who can think and feel like a human, what are they used for? Why, to fight for fun, obviously! DUH!!! Ikki Tenryou, a ten year old boy, is frustrated over being the only kid in school without a Medabot. He only has just about enough money to buy an outdated model, and that's without a medal, meaning that it won't work. And his parents won't buy him one. But one day, Ikki finds a medal in a lake, and he can finally start to become a Medafighter(a guy with a Medabot). Only one problem; his Medabot(that he has named Metabee) doesn't like him that much, and unlike other Medabots, he doesn't follow orders automatically. Remember the first episode of Pokemon where Ash and Pikachu becomes friend in ONE episode? Yeah, that's not happening here. Through several episodes, Ikki tries to tame Metabee and gain his respect, but it's harder than one would think. Metabee KNOWS that Ikki needs him, so he really pushes his "masters" patience for no other reason than, well, he can. But he also knows that he needs Ikki to fight, something Metabee wants to. So the two of them tries to make it work as well as possible. I might as well point out the show's weakest point: the low-budged animation. This is a show from 1999, but the animation looks really, REALLY old. And that's not a compliment. There are some episodes that looked pretty good, but some scenes looked pretty horrible. There is also a awful lot of reused scenes and stock footage. But if you can learn to live with it, then you can enjoy a pretty good, if anything child-friendly animated show(it does have it's darker moments, though). The series obviously reuse a couple of ideas from Pokemon, such as a gang of criminals called the Roborobo Gang who uses Medabots for their evil deeds. ... Well... more or less evil deeds. They are actually not that evil to begin with. Their "crimes" are more mean-spirited or annoying than anything else. Until the evil Dr. Meta-Evil(Subtle!) takes over the gang and makes them steal rare Medabot medals. This show may not be the greatest cartoon in history, but it was pretty entertaining. It had some fun battles, some nice designs for the Medabots, and some pretty good drama, especially the episodes that focus on Rokusho, the mysterious Medabot without a master. I can get a little TOO goofy fnow and then, but hey; it's a kids-show!